Obituary for Mrs. Verna J. (Carlson) Webb | Hinchliff-Pearson-West, Inc.
Verna J. Webb, 91, of Galesburg, died at 9:08 a.m. Wednesday, December 5, 2018, in Galesburg Cottage Hospital. She was born August 14, 1927, in Victoria, Illinois, the daughter of John and Alice (Hedburg) Carlson. She married William J. Webb on October 17, 1945, in Galesburg. He preceded her in death April 8, 2002. She is survived by her three daughters, Terry (Phillip) Richardson of Chuckey, Tennessee, Nan (Charles) Colin of Scales Mound, Illinois, and Rose Marie Webb (Linda McKelvey) of Galesburg; seven grandchildren; 16 great grandchildren; and three great-great grandchildren. In addition to her husband, she was preceded in death by her parents; two brothers, Max Carlson and Fred Carlson; and two sister Margie Van Lueewan and Melba Schindler. Verna graduated from Victoria High School in 1945. 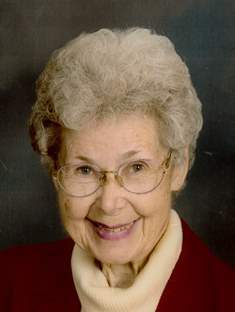 She was a salesperson for Scrivens Quality Gift Store for many years. She enjoyed baking coffee cakes for family and neighbors. After retirement, Verna and William enjoyed extensive travels that took them around the world. She loved to stay active walking and riding a stationary bike. Verna was a devout member of Immaculate Heart of Mary Catholic Church for over 50 years. Funeral Mass is scheduled for 11 a.m. Monday, December 10, 2018 at Immaculate Heart of Mary Catholic Church. There will be no visitation. Cremation will be accorded after Mass with burial in Victoria Cemetery at 11 a.m. Tuesday, December 11, 2018. Memorial contributions may be made to Immaculate Heart of Mary Catholic Church. Hinchliff-Pearson-West Funeral Directors and Cremation Services Galesburg Chapel is handling arrangements for the family. Online condolences may be made at www.h-p-w.com.